40 Hours in Hyderabad. On the 26th, Sanoop and I flew to Hyderabad with his brother and sister-in-law, leaving the kids with their grandparents. We stayed at an old colonial hunting club, The Secunderabad Club, complete with morning yoga classes (my first yoga classes in India! ), newspaper-reading-clubs (we didn’t join those, but they looked great, haha! ), a strict dresscode (for the men, that is) in the bar and dining areas, pools, cricket grounds and tennis courts, a petrol station and a bank… basically everything you need in life. Lush and leafy. Nice respite from the hustle and bustle and honking of the surrounding city, which is rich in history, culture, industry … and pollution. Our main objectives were spending time together and eating biryani. In our less than two full days in town, and starting out at a giant outlet of the chain Paradise (decent) a few hours after we landed, we managed to sample 8 different types of the heavy, spice-infused and fragrant rice/meat/gravy dish, accompanied by super tender chicken kebab, thick dal and freshly baked naan, washed down with fresh lime soda. After a blissful yoga class on the 27th, we went to the old city to check out the bangle bazar (we saw how the simple pieces of jewellery were made and bought several glass and wire-plus-bling versions), seek out beautiful scarves for the women in the family, smile at the colourful fruit and naan stalls, cool down with some fresh tender coconut water, visit the monument and mosque Charminar and walk through the lush gardens and opulent halls and galleries of the splendid, fairytale-like palace Chowmahalle. After lunch at Bawarchi (pretty good) and a visit to the sweet shop Dadu’s, we went to check out a small, very neat modern art gallery tucked away in a private garden in a rather upscale part of town before heading for a dramatic sound and light show at the Golconda fort. In between each of those experiences, we spent 30 minutes in taxis and rickshaws in the most intricate, chaotic-looking but surprisingly well-flowing traffic I’ve ever experienced, taking naps and taking in the impressions of the very diverse-seeming city. After dinner at a place called Four Seasons (indisputable favourite), we wanted to get a night cap at the Falaknuma, but we got rejected at the entrance for not having a reservation – and all four fell asleep on the uber drive back to the club, haha. The next morning, after yoga and a breakfast of idli, sambal, lemongrass/tomato chutney and strong black coffee, we all just hung around our little oasis for a few hours, chatting, reading the newspaper, checking emails… and I went for a run around the perimeter of the cricket grounds, just trying it out to see how it felt and finding that it was completely painfree and easy – my first real run since I tore my ACL and meniscus 8 months ago. I’ve been trying it out for weeks, first with my physiotherapist and then alone, going at short intervals, regaining confidence and finding that it hurt less and less but still felt quite tight and wobbly around the knee cap. That morning, feeling curious about giving it a go and eager to get some exercise after all of that rice and gravy, I kept saying to myself that I could stop at any time, but with each completed round of the deserted, tranquil track, it just felt easier and lighter. Such an immense relief – regaining a sound, integral part of your life. The rhythm of it, the physical and mental benefits – feeling your blood pump and your diaphragm and lungs working, sensing thoughts come and go in your mind as you notice new and familiar things around you or notice nothing at all… After 45 minutes of increasingly speedy circles, I went back to our room and had a cold shower and got ready to leave. We were picked up for lunch (no biryani this time; just different curries and even a raw salad – the first crunchy greens we’d had for a while) with some sweet relatives before heading to the airport. Kerala. On the evening of the 28th, we landed in Cochin, back in Kerala for the first time in 9 months (see this and this post from our last visit). This time, I was not the new face in town; my parents were. They landed just after us, after a blissful extended transit in Dubai, and after a bunch of long, happy hugs, we all climbed into the minibus that Sanoop’s parents had hired for the week and drove to his parents’ home, 2 hours south of the airport. By then, Sanoop’s parents, his sister-in-law’s parents and the kids had also made it there. My parents, Sanoop and I were staying with Sanoop’s parents, while the rest of the flock were staying with their neighbours. They live in a compound of pretty white two-storey villas right by a river framed by paddy fields and coconut trees on the outskirts of Kottayam. Once again, a lovely respite from the busyness of the city, and a great spot for all of us to hang out and have a nice time together between excursions. Sanoop’s parents were eager to introduce my parents to everything that Kerala has to offer, but for now, the four days they were in the country, the essential thing was for them to meet each other and get to know each other: we had one outing per day, and other than that, we spent most of the time at home, eating all of Sanoop’s mum’s traditional treats, drinking coffee and Indian wine, talking, laughing, going for pleasant walks and runs down to the river and vibrant fish markets, hanging out in blissful, comfortable silence, in the house and its lush garden… I see, or at least communicate, with my parents fairly regularly, but it was especially nice to see them in a completely new context – I’m glad Amma and Acha invited them and that they were up for making the long trip. Houseboat. 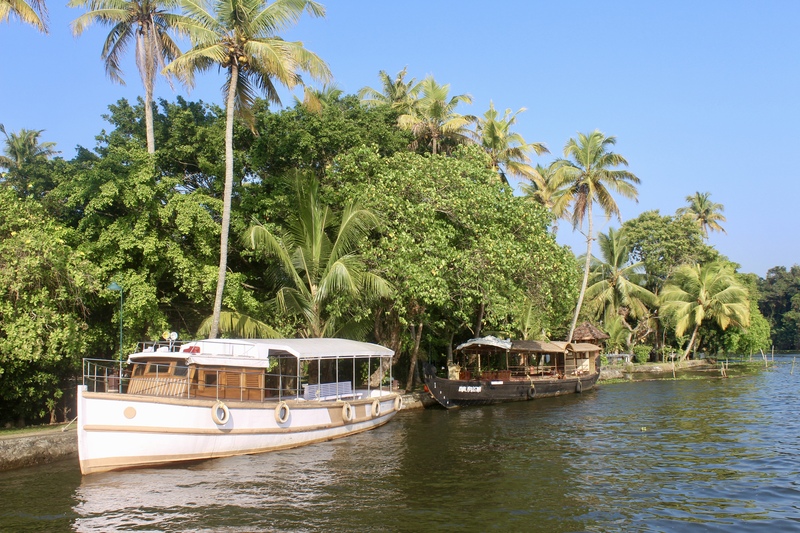 On the 29th, we went sailing in a wooden houseboat on the backwaters – Sanoop’s birthday gift to all of us. A wonderful way to be together, as everyone could just drift around on the deck, chatting to this or that member of the family, napping, playing games, taking in the gorgeous views around us, the many water lilies, birds and elegant wooden boats on the canals and lakes, the lush greenery surrounding the water, the blue sky above. We celebrated Sanoop’s 36 years onboard, drinking coconut water straight from the nuts and toddy (palm wine made from the sap of coconut trees) and Indian wine from plastic cups, eating a big lavish lunch full of Kerala specialties, with bananas fried in turmeric for dessert, singing the English and Danish birthday songs as he cut his cake… My gift to him was a sweater to wear when we go skiing in Italy next month and for when it’s winter in Australia and on chilly summer nights in Denmark and a chain full of paper flags for all of the countries he has lived in – with the Danish flag and cutouts of the three globe emojis thrown in for good measure. In Denmark, the national flag is a birthday symbol, and so for my birthday, he made a bunch of Danish paper flags; this was my way of creating a new tradition for us 🙂 My parents gave him some cool ski gear, and from his own parents, he got a nice blue shirt from Fabindia. They all four got some good opportunities to chat on the boat, and it was nice to see them interact – all four so kind, open and interested… and in their right element on the water as well. Very novel and lovely for Sanoop and me to have them all in one place – our parents and his brother and his family… after long days in Goa of playing, singing and laughing with the kids, having them sit on our laps on long drives and listening to tales about their best friends and favourite foods and hobbies, sleeping with them between us, we’d missed them in Hyderabad. When my parents joined the group, the kids got a little bit shy, but after a few hours on the boat, they were back to running around and saying and doing hilarious things. They did calm down as well – with yoga poses on the deck – giving us plenty of opportunities to catch up with our parents as we were sailing along on the calm water. Ayurvedic Massages. The day after, we all had an Ayurvedic massage. Some went to a hospital for it, others went and saw a freelance guy, and my parents and I went to the same blissful retreat that Sanoop and I went to back in March, Athreya Ayurvedic Centre. Here, you’re led into a separate room by two women or two men depending on your gender, where you undress for a full-body massage – the two practitioners rubbing your face, scalp, neck, front, back and sides in synchrony with heaps of strong-smelling Ayurvedic oils. After that, a cleansing steam treatment in a wooden box with just your head poking up from the heat. A very special experience, and I was quite excited to see what my parents would think – but they went in with an open mind and both loved it. Our skin and eyes were glowing on the way back to the house, haha. New Year’s Eve. I used to always get quite sentimental on the last day of the year – thinking that I hated goodbyes. Somewhere down the line, however, my consciousness has shifted from a circular to a more linear way of thinking – no doubt, 2017 was the best year of my life, but every day is a new, great day. New Year’s Eve is a time to celebrate – one of many memorable moments. Twice, I celebrated it skiing with friend and family in the Alps. Last year, surfing with a friend in Bali. But most often, I’ve welcomed the new year at house parties in Denmark following a traditional recipe: dressing up nicely, drinking dry champagne while watching the queen’s New Year’s Address at 6pm, eating a fine 3-course dinner, watching Dinner for One and then drinking sweet champagne and eating a special marzipan cake after jumping off a chair and happily into the New Year at the stroke of midnight, watching the fireworks until the early hours of 1 January. This night was special: It’s been 15 years or so since I last spent New Year’s with my parents, and it’s the first time I spent it with S. All 12 of us went out for toddy, fried local fish and duck curries at a very local pub, and then we returned home to celebrate with champagne and fireworks, everyone hugging and kissing each other at midnight, except for the kids who dozed off at about 11pm. Everyone else followed suit shortly after 1am… haha. Family. The most remarkable thing about my parents being in India for the first time was noting the cultural differences and similarities between Denmark, or Europe, and India. And America as well, where Sanoop’s brother lives with his family – and where the rest of the Indian part of our flock also lived for parts of their lives. We spent a lot of time comparing and contrasting traditions and customs, learning new things and being grateful for our freedom to choose how we want to live our lives. Everything from the urban layout and traffic to the food and way of clothing varies a lot from nation to nation, but then there are also so many recognisable aspects. The ways in which family members interact are universal – at least in this family’s case. Kindness, diplomacy, awareness, mutual interest, space. Everyone was positively surprised at my parents’ spice tolerance – they ate everything despite nervous hotness warnings, quietly and happily, quickly learning how to eat with their hands, a great way to really sense the food, saying yes to seconds, curious about the variety and ingredients, especially when it came to the dishes eaten from banana leaves. My mum has always cooked very flavourful food – Sanoop’s mum gave her bags of spices from the highlands of Kerala to take back home.